Someone on my Twitter feed suggested I draw some cards for the solstice. So yesterday, I did get up early, and I did a spread for solstice before I went to work. 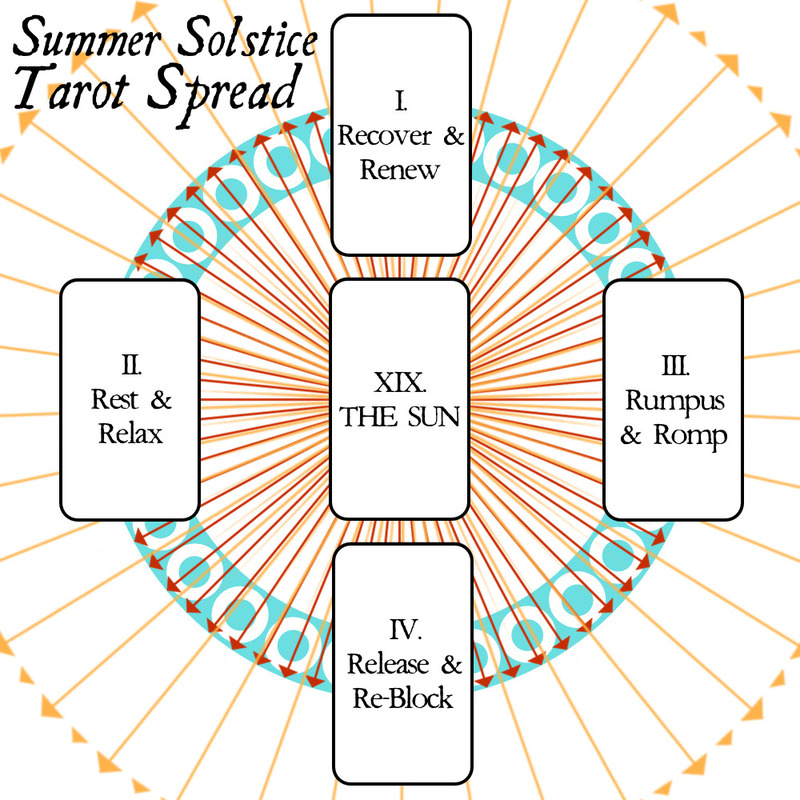 I am using Evvie Marin’s Summer Solstice Tarot Spread. I had seen this spread a while back, jotted it in my Tarot journal a couple of years back. When I went to look for a spread this year, I figured a few Tarot folks would have shared a spread or two online for the observance. I could not find one, but fortunate for me I had saved Marin’s spread, which served me well. 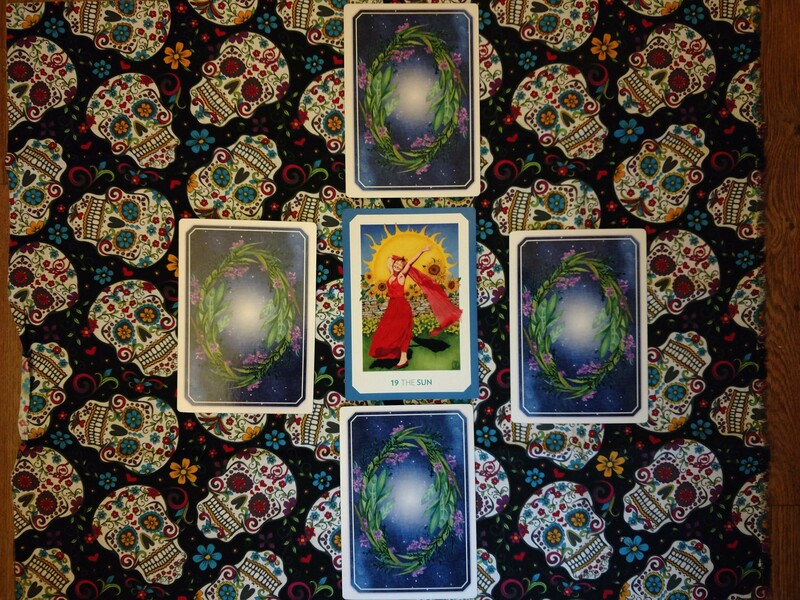 Card positions and reading. As noted, The Sun-19, is in the center position. 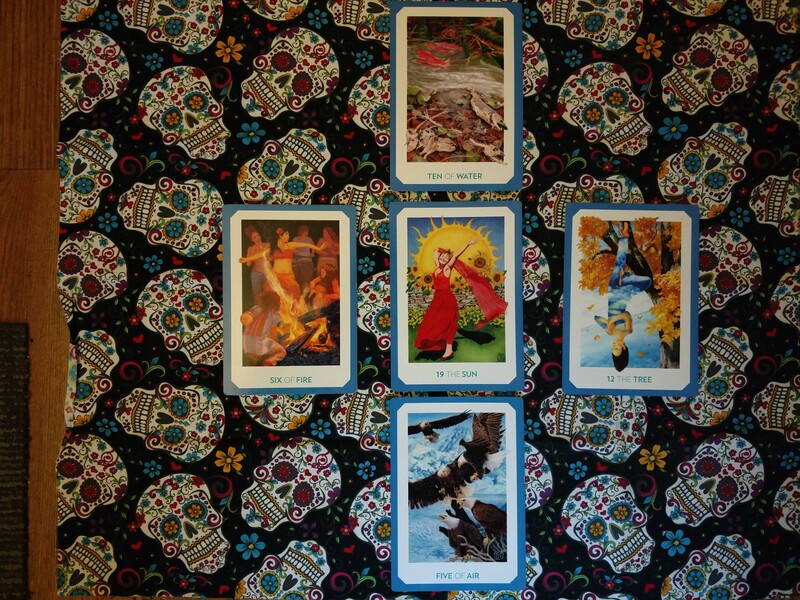 I am using the Gaian Tarot for this spread (link to my review of the Gaian Tarot deck). The card affirmations come from the deck’s companion book. My summer solstice spread before revealing the cards. In the center is the Sun-19 card. My summer solstice spread, cards revealed. Recover and renew: Ten of Water (Ten of Cups). Soak up energy to make it to that last stretch. Ask what needs to come to an end so rebirth can happen. What legacy am I leaving behind for others? What do I leave so others can grow? Leave the old behind and move into the new. Card’s affirmation: “I have given my best and can rest assured that love will continue to flow” (134). Rest and relax: Six of Fire (Six of Wands). Rest and relax more. I need to remember that even if I do things quietly, those who need to know will know; the rest of them do not really matter. Take the time to express yourself creatively, just for the fun of it. Things are working out, take some time, rest, celebrate. Take small breaks and be grateful for and enjoy the good you have. You’ve worked for it and earned, so live a little. Card’s affirmation: “I passionately celebrate myself and my tribe” (112). Rumpus and romp: The Tree- 12 (The Hanged Man- XII). In moments of quiet and solitude. This is a good time to take a little time off, go off, and see things from a new perspective. Theme should be go do something different, see something new, explore and reflect. Take some time to turn things for a different look. Clear space so you can center. Card’s affirmation: “I find serenity in surrendering to the Great Mystery” (52). Release and Re-Block: Five of Air (Five of Swords). I need to know when to let go off things. You may win some, but others it is better to let go to keep the peace. Choose your battles wisely, and as much as possible, avoid alienating others. If anything, if they take rope to hang themselves, let them have it and stand back. Rather than adding to drama, let it go. Many conflicts can be sidestepped, and you can still come out ahead. Card’s affirmation: “I defend my own place in the world without resorting to bitterness or hurtful words” (106). Overall, a theme of remaining calm, find your center. You know you are on a good and right path, and your tribe, those that matter, know it and celebrate with you. Keep persevering and avoid unnecessary drama or conflicts. Defend what you need to defend, but otherwise, live well and let the rest go.